A world full of zombies sounds horrifying. Undead bodies roaming the earth looking for brains. Not cool. Anarchy all around. If there is anything that I know from playing zombie games, there aren't families running around together, that's for sure. It's always a lone wolf, or a small group of "survivors" that end up battling the hoards of zombies together. It's not the ideal world that I want to be in. On the other hand... think of the possibilities! Science (or nature) has found a way to reanimate the dead. How awesome could that be! Let's just forget about the eating of brains and rotting flesh for a second, if you can harness the power of reanimation, no one would need to be scared of death anymore! I mean, of course, science will need to do some tweaking to make sure we know what we're doing but c'mon, man! Immortality! It's definitely a horrifying thought that zombies could roam the Earth but you must admit that the idea is definitely intriguging. 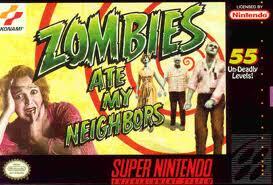 If it weren't, we wouldn't have so many games/movies featuring zombies. I'm sure that if it came down to it, the Metallman family will be well prepared. We already have a sword and couple of daggers, but I'm gonna need me some guns. The boy has been honing up those zombie killing skills in Left 4 Dead and has already mentinoed to me that a samurai sword is not gonna cut. lol Either way, it's very intersting... interesting indeed. What do you think? Later!